I'm obsessed with glowing skin and can't leave the house without some highlight. I normally favour a powder highlight but more and more I'm liking a liquid highlight and loved them on holiday for a dewy look. In terms of liquid glow products I like both subtle ones that can be used all over the face or more intense ones that are highlighters. Unfortunately this range has been discontinued which is a real shame as I have tried quite a few products from them and they are lovely. This is a balm formula is a silver toned highlight that I apply as a base before my foundation and it adds luminosity to my skin and glows through my foundation. The formula of this is still light enough to wear underneath foundation without feeling heavy or clogging up the skin. I love that drugstore brands are bringing out liquid highlighters and they seem like amazing dupes for higher end ones such as Cover FX. This collection by Barry M comes in 4 shades and I have At First Light, which is a soft peachy, pink that works well with my skin tone and really pops on the skin. I like applying this as a highlighter and then applying a powder on top that sticks to this and stays put all day. This is one of those beauty products that I need to start using more as its so dreamy. It's an illuminating primer that brightens signs of fatigue on the skin and create that soft focus Instragram filter look. This has a lightweight texture that blends in seamlessly and allows my foundation to melt into it but also still glow through. Like the Barry M ones these MUR liquid highlighters are a dupe for the Cover FX ones, although I haven't tried the Cover FX ones these are such a lovely product. 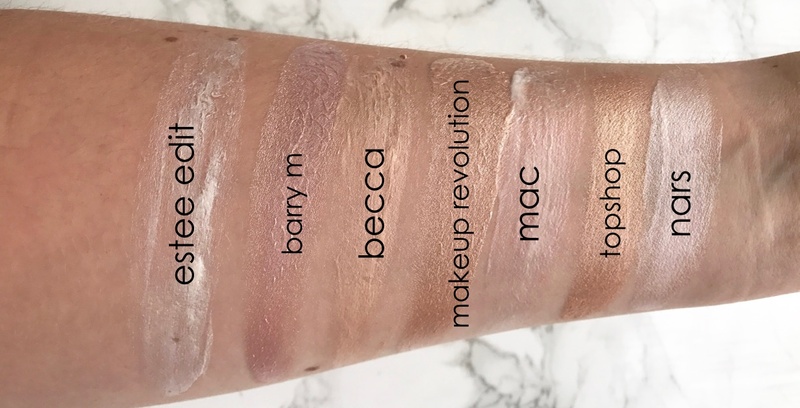 This range comes in several shades and I have three, the one swatched in this post is Champagne, which as you can tell is a soft focus gold shade and one of my favourite highlighter tones. I have found that these apply nicely but if you try and blend too much it can separate and not look great soft I always softly dab on with a beauty blender. Again applying a powder highlighter on top makes it really pop. I am on my second mini of this so should probably just buy the full one. This is a moisturising primer that has a pearlescent sheen to it that boosts the look of tired and dull skin. The creamy formula smoothes over the skin and helps the skin look brighter with light reflecting particles. This contains nutritious vitamins and green tea to boost the look of your skin. This is a little different to the others in that it is more of a mousse/cream compared the the more liquid ones in this post. This blends so beautifully into the skin and magnifies straight away so it doesn't look too greasy. I apply this with my fingers and either leave on its own or add another powder highlighter on top. This was one of the first liquid highlighter I picked up and is still a firm favourite. This is a very shimmer highlighter and literally pops on my skin. Again its a very light formula that blends in easily and can be built up depending on the look you want. I also love to use this on my collar bones are shins on a night out. 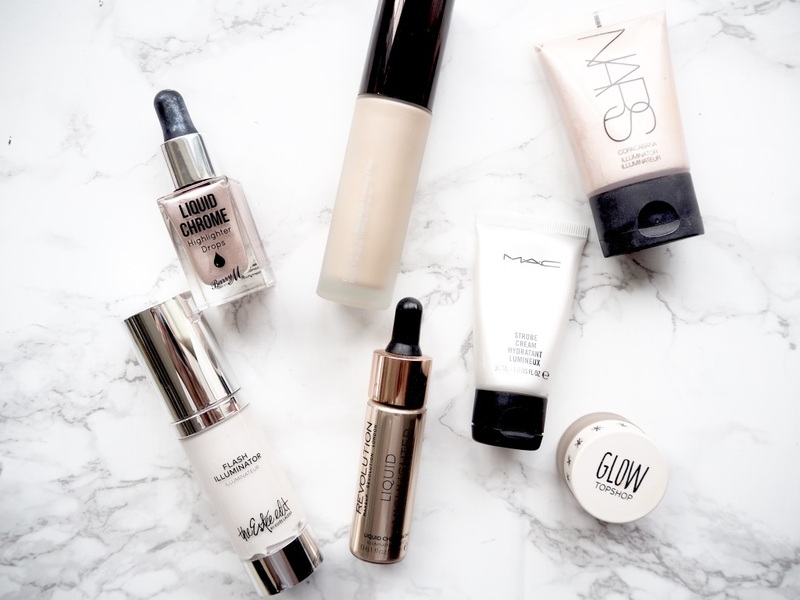 Do you have any liquid highlighter favourites? I love the Topshop Glow Pots! I have the one in Polished and it's such a pretty, multi-dimensional shade. NARS Copacabana has been on my wishlist for ages. I need to pick it up! These are all so pretty! I always hear ladies raving about the NARS one. I must see what all the hype is about!